Examples from Retrieval Total Joint Replacements. 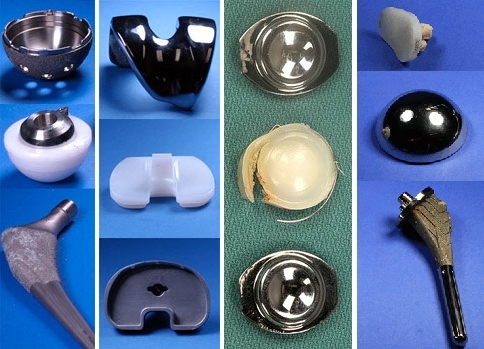 From left to right, hip, knee, spine, and shoulder implants. Total joint replacement remains an effective treatment for degenerative joint disease. We characterize the clinical and material performance of biomaterials used in total joint replacement after their use in real world conditions using a variety of techniques. We are interested in materials in use at many different anatomical sites such as hip, knee, spine, shoulder, elbow and ankle.